There’s nothing more thrilling at work than to collaborate with truly inspired customers who are building meaningful solutions. Last month, Kandy shared the story of a new platform which Kandy’s real-time communications platform powers – CoolDoctors. The team at CoolDoctors, led by visionary CEO Rajesh Ramchandani, believes advancements in technologies now part of the CoolDoctors telehealth platform will help patients who need on-going care for conditions such as Glaucoma, Macular Degeneration and Diabetes to manage their care from home without having to spend time driving to their doctor’s office for every visit. This reduces the cost of care significantly, and saves thousands of dollars for each patient with eye care needs through safe and proven alternatives to office visits. The CoolDoctors cloud-based platform and mobile application, which includes voice, messaging and video features, was featured at the Telecom Council Carrier Connections conference September 28 - 29 at the Computer History Museum in Mountain View, California last month, and has been in use for several months. The user experience, designed impeccably by the CoolDoctors team, makes it easy to download the app, register, and start using the virtual visits feature right away. It is fully HIPAA compliant, and serves both the patients and the practices with more convenient, less expensive and highly effective collaboration whether helping diagnose non-urgent situations (dry eye, for example), or for post-Lasik surgery follow up visits. The CoolDoctors application, which is available for Apple and Android device downloads, also includes several important eye tests, which allow users to perform self-evaluations at home and share them with their doctors for offline evaluation. This automation of follow-up care is proving to increase patient satisfaction, improve clinical outcomes and bring additional revenue to ophthalmology practices. 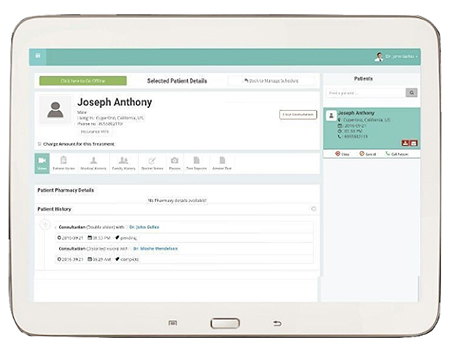 Their cloud-based platform provides access to the patient’s doctor’s portal from anywhere using the mobile app, or any laptop or desktop computer with a Google Chrome browser. The mobile app makes it easy for patients to select their condition from a list of options that can be treated via telemedicine. After selecting the condition, the patient simply answers a few questions and uploads picture of the affected eye(s). They then connect with their doctor for a video evaluation. The doctor can prescribe the appropriate treatment plan and prescriptions if needed. Healthcare is one of the most exciting industries benefitting from the powerful, affordable real-time collaboration capabilities WebRTC makes possible. CoolDoctors is leading the way in the eye care world, and the Kandy team could not be more proud of what we were able to contribute to this breakthrough solution.